The mission of the Cassini space probe ended on September 15, 2017 with its destruction in the planet Saturn’s atmosphere, but the wealth of data collected over the years spent examining the gas giant and its moons keeps on being studied. Titan was one of the main targets since the mission’s project’s phase because some interesting characteristics had already been noted and a chemical or even biochemical activity was hypothesized, even if very different from the one existing on Earth. A number of Titan flybys by the Cassini space probe allowed to discover over the years a lot about this moon that in many ways seems a smaller and above all much colder version of the Earth with surface temperatures around -180° C (-292° F) with the consequence that its rivers, lakes and seas are full of liquid methane and ethane instead of water. 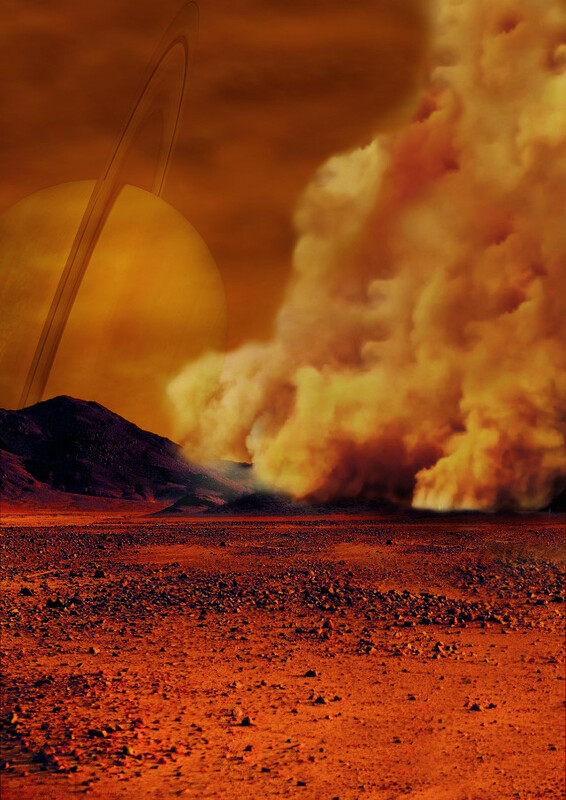 Seasonal cycles, clouds, dunes, rains and more on Titan make it strangely familiar, and now a team of researchers led by astronomer Sebastien Rodriguez of the Paris Diderot University in France brought evidence of another cycle similar to that of Earth, the dust cycle. Initially, when the researchers discovered three equatorial Titan areas with an abnormal infrared brightness in images taken by the Cassini space probe in 2009, their first thought was that they were methane clouds. Further investigation revealed that they’re something quite different. Dr. Sebastien Rodriguez explained that methane clouds in that area during the equinox period on Titan are impossible according to our knowledge of their formation. These clouds would contain large droplets and should be at a high altitude, well above the 10 kilometers at which the bright areas were identified. Further investigations made it possible to rule out the possibility that it was a rain of frozen methane or icy lava on Titan surface but those areas had to be in the atmosphere. Since they were right above a dune field on Titan’s equator, the remaining explanation is that they’re dust clouds raised from the dunes. Specifically, it’s the so-called organic dust, which is formed when organic molecules formed by the interaction of sunlight with methane become large enough to fall back onto the surface. There must be strong winds to lift that dust creating a cycle in which it’s transported over considerable distances. This was observed only on Earth and on Mars. 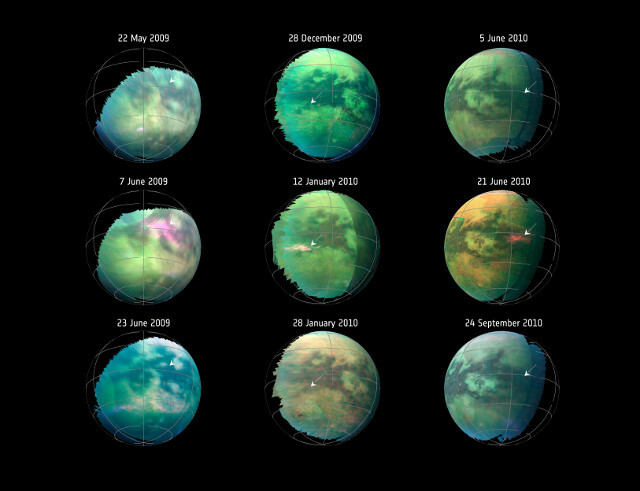 The study of Titan’s images showed three cases in which between 2009 and 2010 areas with the characteristics of dust storms got spotted. These discoveries on Titan should no longer be a surprise since it’s been known for quite some time that the moon is active despite its very low temperatures. Its atmosphere is by far the thickest among the moons of the solar system and this makes possible a series of weather cycles and much more. For this reason, the data collected by the Cassini space probe could still reveal other more or less surprising features.